hmmm...remember when Homer Simpson cloned himself to get more done? This is Mike. One month to go. Our apartment looks like all the rooms simultaneously threw up. But I guess that's part of packing. 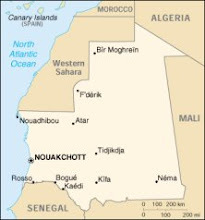 We've purchased many fun new items: mosquito tent, solar shower, shortwave radio, laptop computer, Africa guitar (thanks Chuck), and my favorite, a leatherman multi-tool. I now carry a tool on my belt like a tool. I've also taken many steps to end my tenure as a guitar teacher in Lawrence. It's been hard letting go of many students. It's a weird job to have and even more strange when you have to quit. It's like having 40 bosses you get to teach and you enjoy their company. We have also had many events and more to come. The most exciting for me, was my sister's wedding. Regina and I were only a year apart growing up so we are extremely close. She was married to Chad Kraus (another NY architect) on a ranch in the Tall Grass Prairie. It was a ballsy move, but they had a perfect weekend weather-wise (look for the pictures). We also had Katie's sister's graduation and my two engaged friends' (Casey and Jenny) graduation. That means all we have left is: Ben and Amber's wedding, Brendan's 30th b-day, Adam's wedding, a family reunion, 4 going away parties, moving, oh and record a cd with my band. Gotta go. We just had our first round of good-byes with family :( Mike's sister, brand new brother-in-law, and his brother's family will not be seeing us again before we depart. It was rough...and made even more difficult knowing that we will have several more tearful partings to get through before we go. But...that's to be expected I guess. On a more happy note, we've had several fun experiences over the past couple weeks to recount. 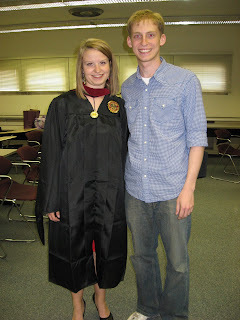 First, my sister Annie graduated with her Master of Science from Illinois State University (Go Redbirds!) on May 10th. Mike, William, Dad, Aunt Liz, Momo & I all joined Annie in Normal-Bloomington for the commencement ceremony and had a great time (pictured are Annie and Will). Mike and I also were able to make a short side trip to Champaign, IL to meet a fellow PC RIM invitee named Becky Robinson. This past week we were able to spend a lot of time with Mike's family in preparation for his sister Regina's wedding on May 17th. 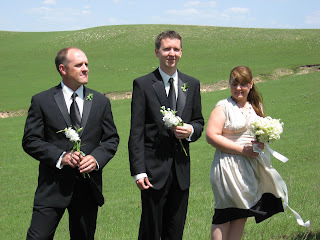 The wedding was absolutely beautiful and took place outside on the tallgrass prairie near Council Grove, KS. The reception was also outside at Mike's parents' house in Kansas City. I have a few pictures but they don't do justice to the beauty of the actual experience. We'll also take this opportunity to introduce you to a new feature of our blog: Our Photos. I've uploaded several photos both current and past to this site. Hope you enjoy browsing through them. There are several of Regina and Chad's wedding, although I didn't take any of the actual ceremony or at the reception because I was too busy enjoying the experience. Please let us know you are reading our blog by leaving us comments!!! We really like them :) and are happy to know that somewhere out there, someone is paying attention to what we write here. We'd also like to know if there are any particular topics you'd like us to cover or questions we can answer for you on this blog. I'm currently procrastinating from packing up the apartment...so I'd better get back to work. Our lease is up at the end of the month and then we'll be staying with our parents for the first couple weeks of June before we leave. Yikes...lots to do. Hey, does anyone know someone that needs a car? I'll be putting my Scion on the market soon!